After being recovered in the Pacific Ocean, the Apollo 11 crew was placed into a mobile quarantine unit in case of infection by unknown source on the Moon. This proved to be unnecessary and was discontinued later in Project Apollo. 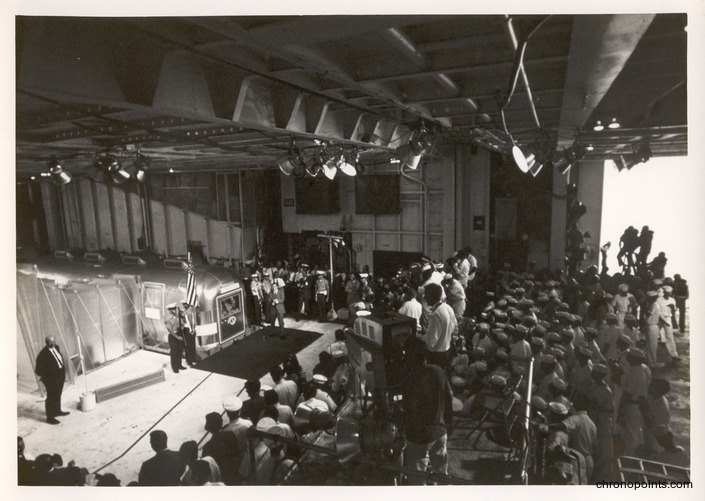 In this photograph, President Richard Nixon (1913-1994) greeted the astronauts on the USS Hornet shortly after they were placed in quarantine. 12 Recovery." Aircraft Carrier USS Hornet Museum. Accessed July 16, 2015. http://www.uss-hornet.org/history/apollo/. 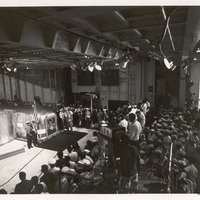 “President Richard Nixon Greeting the Apollo 11 Crew Aboard the USS Hornet.” RICHES of Central Florida accessed April 22, 2019, https://richesmi.cah.ucf.edu/omeka/items/show/6040.